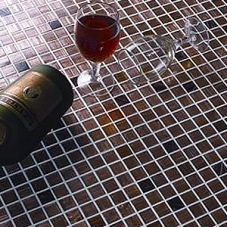 Affordable Glass Mosaic Tile by Puccini - On Sale at Ecomoso Like a perfectly-paired cheese and wine, Puccini Glass Mosaic Tile is perfect for your next project (if you’re the type that likes to stay on the cutting edge of trends when it comes to all things interior design, that is). 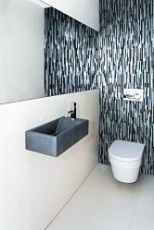 And we think it’s even better when your materials allow for creativity to flow fluidly, like water, throughout your design ideas - which is exactly what Puccini’s pristine glass mosaics do. 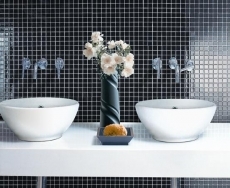 Puccini by Duratile USA and Ecomoso are - and always have been - in the business of quality over quantity. We think after perusing the Puccini Glass Series’, like us, you’ll find that you also have a heart of glass. When it comes to this high-quality, affordable glass mosaic flooring, you’re sure to be on point with the latest in fashionable, functional flooring. In terms of functionality, glass tile has recently gained remarkable and tremendous popularity with its impressive technological advances in cutting and installation. 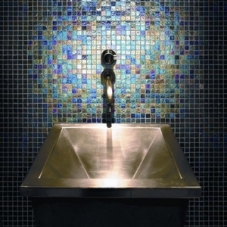 The most exciting part of working with Puccini’s gorgeous glass mosaic tile, however, is that not only are Puccini glass tiles highly functional and water resistant; but they also possess a natural ability to radiate intense colors and reflect light. 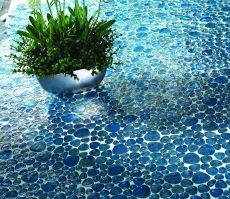 So basically, where other types of flooring are flat out incapable of doing so, Puccini glass mosaic tile has the ability to utilize and play with the beauty of color in marvelous and magical ways. It can transform a room into a chromatic paradise with a simple and elegant touch of light. 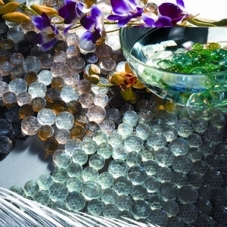 Simply put, glass mosaic tile allows you to harness the beauty of color and light in ways other flooring products just can’t; and it’s also the most suitable material for frequently wet or constantly submerged areas. 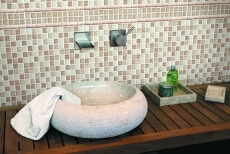 The possibilities within Puccini Glass Mosaic Tile Collections are endless. They provide the perfect finishing touch for your new kitchen backsplash, or to accentuate your upcoming bathroom remodel - whether it’s the floors, walls or a brand new shower you want to cover in any one of the stunning and splendid collections. 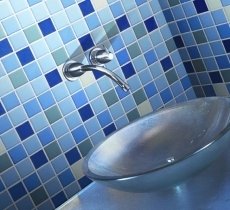 There's no denying the benefits of glass mosaic tile . 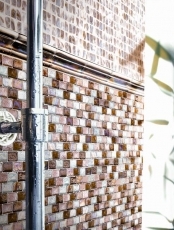 If you don't know the benefits of glass tile, follow the link above. We think the people at UK-based Service Magic explain things pretty well. 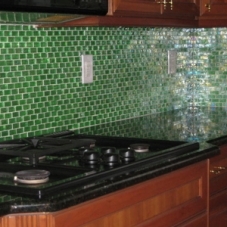 Glass Mosaic Tile is not only gorgeous and artistic, it's also practical and more affordable than you probably think. Here at Ecomoso, we relish the opportunity to help you find your perfect piece of affordable glass tile for your new kitchen backsplash, or your bathroom remodel, or various other projects that call for something special and unique. 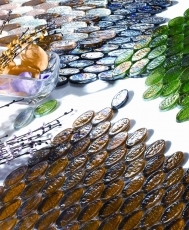 Have fun swimming through Ecomoso’s vast sea of gorgeous, light-reflecting, luxurious, quality, affordable Puccini glass mosaic tile collections.